Are you looking for ways and intends to make your windows spotless yet again? Do you want to know how to skip chores like window washing without lifting a finger? You are in the right place – the experts of window cleaning in Mortlake will deal with this matter in short time. Your windows, their framework and ledges will look perfect, we ensure that! You will no longer have to sacrifice your spare time – the results of our work will fully delight you. Our services merge top-notch quality with affordable price rates, so don't wait – book now to save time, energy and money! We also provide our professional services in nearby areas: Tooting Bec, Battersea, Clapham, North Kensington, South Kensington. You can rest assured that the good look of your commercial building is certain. 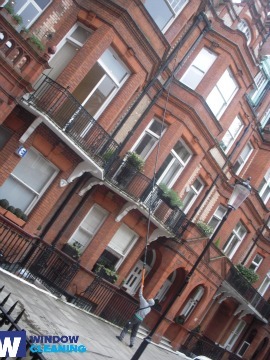 The professionals will will fulfil your need of superb commercial window cleaning. With the help of our water-fed extension pole tools, you will get fast and perfect cleaning of all windows up to the fourth floor. For buildings higher than that, we employ our rope access equipment. It is our next-generation method of reaching glass panes on taller buildings. It doesn't matter what is the size of your business premise – a humble corner shop or reinforced-concrete giant of London – we will guarantee perfect look of your windows. The employees have the experience and the essential equipment to provide you with both domestic and business window cleaning. You can depend on us for every type of glass surface cleaning. For example, we can polish small or double windows, French doors, sash windows, patio doors and bay windows. In addition, if you have garden glass surfaces, conservatory or roof windows, we can clean them as well. We use the most progressive techniques and the next-generation equipment for all the previously mentioned types of windows. We provide high quality window cleaning by using next-generation techniques. We ensure impeccable and pristine look for your glass surfaces, roof windows and greenhouses with water-fed extension pole system and jet washing. The poles we use are attached to water reservoirs in our vans, thus excluding the risk of damage to the exterior of your home or business premise. In addition, we use completely safe rope access methods to clean glasses on tall buildings. You can take advantage of these methods instantly – give us a call on 020 3746 3113! You will have luminous home after the expert window cleaners in Mortlake finish their work. We deliver superb services for the entire London locality. The most advanced techniques are included in our working routine – including water-fed extension pole system and and jet washing. You will surely see the change of your home's entire look – we use purified water for the process of inside/outside window cleaning. Contact us now on 020 3746 3113. Our customer service representatives will help you and answer your queries. Furthermore, you can use our on-site booking from.